Visitors from all over South Korea visit Busan during the warmer months. This gives Busan the title of ‘Summer Capital’. The visitors mainly come to the visit city’s 6 beaches. The beach resorts have lots of luxury hotels, cafes, bars and restaurants. This makes it a very good place to spend a few days relaxing. Travel Bug did exactly that on his visit. He laid out on the beach and did nothing aaaaaall day long. 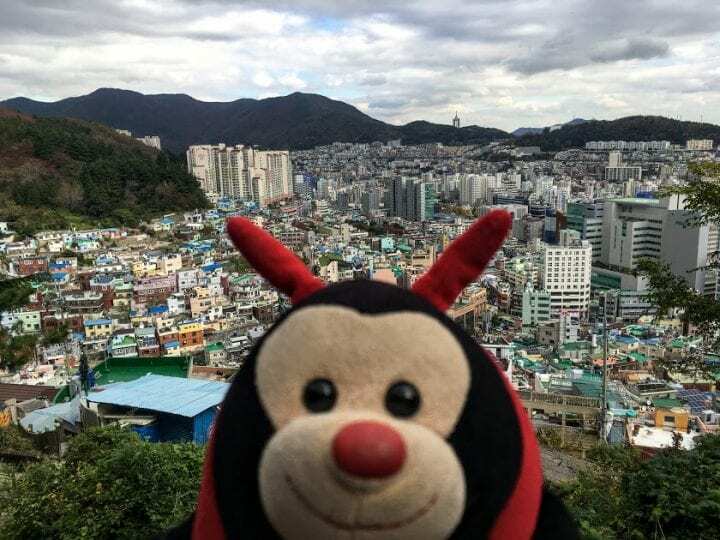 When Travel Bug was in Seoul, he visited the largest underground mall in Asia. When he got to Busan, he visited the largest department store on earth. He thinks South Korean likes to have big stuffs. The Guinness Book of World Records officially lists Shinsegae. It officially surpassed the size of Macy’s in Manhattan back in 2009. Some of the most beautiful temples on the Korean Peninsula are located in and around the city of Busan. Haedong Yongungsa temple is the most famous of them all. It’s known locally as the ‘water temple’ due to its location on the coast. Haedong is a Buddhist temple and it has a giant gold statue of Buddha, which Travel Bug really liked. He asked his humans if they might build one of him in their garden. Do you have any other fascinating facts about Busan to share with the Travel Bug?